Cooking in Britain is undergoing a huge renaissance in popularity.This is partly to do with the growing awareness of buying and cooking with local food and largely to do with the media of television and publishing, and the rise of food writers and celebrity chefs who show the British public their passion of food and cooking. Delia Smith has been one of the most successful of the celebrity chefs, and she can take some of the credit for the current surge in interest cooking programmes on TV, and for cookbooks and books about food flying off the shelves in the country’s bookstores. Somewhat of a cult chef, who hasn’t become too exposed in the media, and seems to prefer to cook (or to experiment with cooking and push forward the culinary boundaries of cooking as a science), Heston Blumenthal became famous for his restaurant The Fat Duck in Bray, Berkshire where he experiments with combining seemingly disparate tastes. His pre-occupations are taste, aroma and flavour perception, and he offers patrons some of the following dishes to challenge theirs: oyster and passion-fruit jelly (with lavender), snail porridge (with ham), salmon cooked in liquorice, and his famous egg and bacon ice cream. Jamie Oliver is a cooking and media sensation. His range of television programmes range from 'Seasonal British Food' to 'Travels in Italy' and his work with the British institution of school dinners and dinner ladies is well known. He has rightly been awarded an OBEfor this work. He also has pioneered a cooking school for young offenders with his restaurant chain 15 (which has also been successfully filmed in a series for Channel 4), and he has cooked for Prime Ministers and visiting monarchs. Gordon Ramsay has established himself as the ‘bad boy’ of British TV chefs. His numerous cooking programmes, which follow him either setting up restaurants, such as his recent endeavour in New York, or cooking with celebrities, or being a trouble-shooter for restaurant owners up and down the UK, often show him displaying his temper, or losing patience with a member of staff. His restaurants are hugely popular and attract a high standard of customer. This show has become a cult classic on British daytime TV, and has been bought by many other TV networks around the globe. It features either celebrity chefs or ordinary people, cooking their favourite dish in a set amount of time (usually half an hour), competing against one another, to win a cash prize or a charity donation. Often chaired by celebrity chef, Ainsley Harriot, who has become a media star through being involved with the show, the programme is about cooking – the science of it, coupled with the skill and the speed of it, and how to combine it with flair and showmanship. 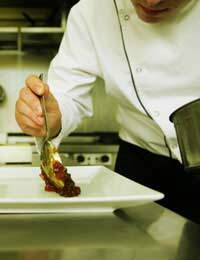 It is definitely true that this rise in chefs becoming celebrities has increased British interest in cooking. There are now so many more good sources for recipes and ideas – the TV programmes, the books, magazines, the Internet and more. This, coupled with the proliferation of great British food – the raw ingredients growing either right on our doorsteps or locally, means now is the time to be cooking: learning to cook or loving to cook. Get inspired, get cooking!